At 15, I was firing machine guns over Lake Champlain. 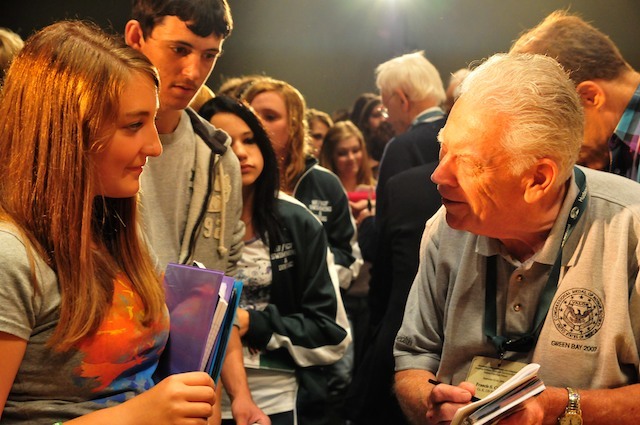 I recently signed one of my books to World War II veteran Leo Dean, which former student Cassie K. purchased for him for Christmas at my last book signing. 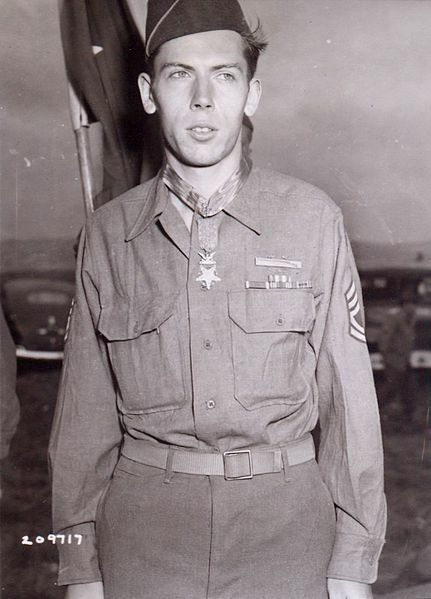 Leo was a member of the handpicked 517th Parachute Infantry Regimental Combat Team, which saw action in Europe and heavy fighting in the Battle of the Bulge, which broke open 71 years ago this week. Later, he got to go to southern France several times to revisit the towns that they liberated, with a contingent of reenactors and veterans, who were welcomed by the French people with love and open arms. I did not know Leo, I but wish I had. Leo passed away at work at the age of 91 last week. Rest easy, Leo. He is an article by Paul Post of the Saratogian that appeared in 2014. Leo Dean took up skydiving at 75, when some people that age have resigned themselves to a rocking chair. This Saturday, weather-permitting, the World War II veteran will celebrate his 90th birthday by making his 162nd jump in Fort Ann, and he’s looking for other daredevils to join him. While a relative newcomer to the sport of skydiving, Dean is no stranger to jumping out of airplanes. 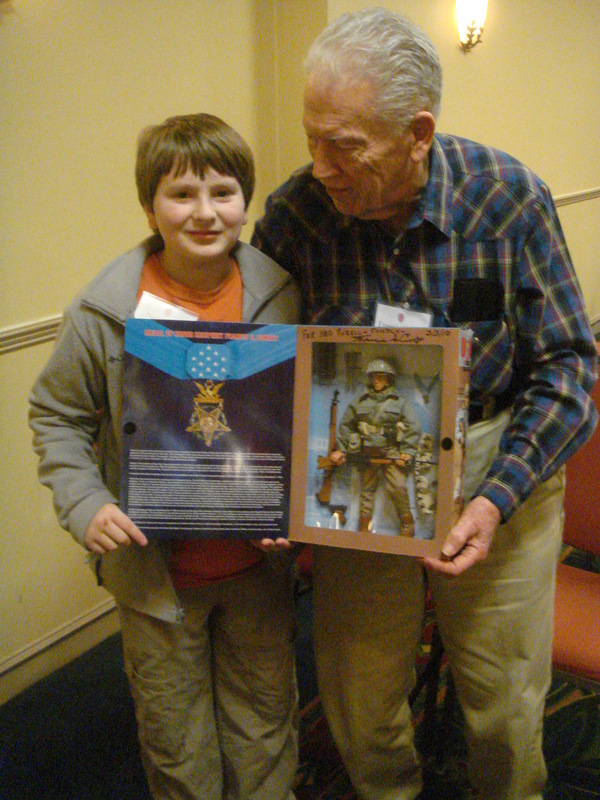 During the war, he belonged to the 517th Parachute Regimental Combat Team that suffered heavy casualties during the invasion of Southern France, and later fought with ground forces in the Battle of the Bulge. “My cardiologist asked me, ‘Are you still skydiving?’ I told him, ‘It’s better than the pills you give me.’ It keeps my adrenaline pumped up,” Dean said, laughing. Nothing much seems to stop him. Renee Farley, a close family friend, said she was lounging on a beach in Jamaica one day when a parasailer drifted by, waving at her. Sure enough, it was Dean. Last spring, the Albany resident was a special guest at The Great Escape theme park, where he helped christen the Screamin’ Eagles, a new thrill ride. Saturday’s planned outing, led by Adirondack Skydiving Adventures, is obviously a bit riskier — and higher off the ground. In deference to his late wife Helen’s wishes, Dean gave up parachuting for most of his adult life. After she passed away, he began having second thoughts. Several friends have already agreed to jump with him on Saturday. However, at least two more are needed. If eight others take part, Dean will be allowed to jump for free. Dean said he wrote to former president, World World War II veteran and parachutist George H. Bush, inviting him to go along on his birthday adventure. Bush marked his 75th, 80th and 85th birthdays with parachute jumps. “He wrote back and said, ‘Sure, if Barbara lets me,’” Dean said. Dean likes to kid about his skydiving pursuits, but turns serious when reflecting about his wartime service. As a teen, in the 1930s, he went to month-long Citizens’ Military Training Camps, a summer program held each year from 1921-40 that gave young men basic military training. But unlike the National Guard and Reserves, there was no obligation to call-up for active duty. One of the largest camps was near Plattsburgh. Dean faked his age so he could join the program early. Five years later, however, Dean was fighting an enemy that shot back. He got his first taste of combat north of Rome, in the summer of 1944. On Aug. 15, his 517th parachute team left Italy and crossed the Mediterranean for a night-time jump into Southern France. Although overshadowed in history by D-Day, two months earlier, this highly successful invasion was critical to the war’s outcome. 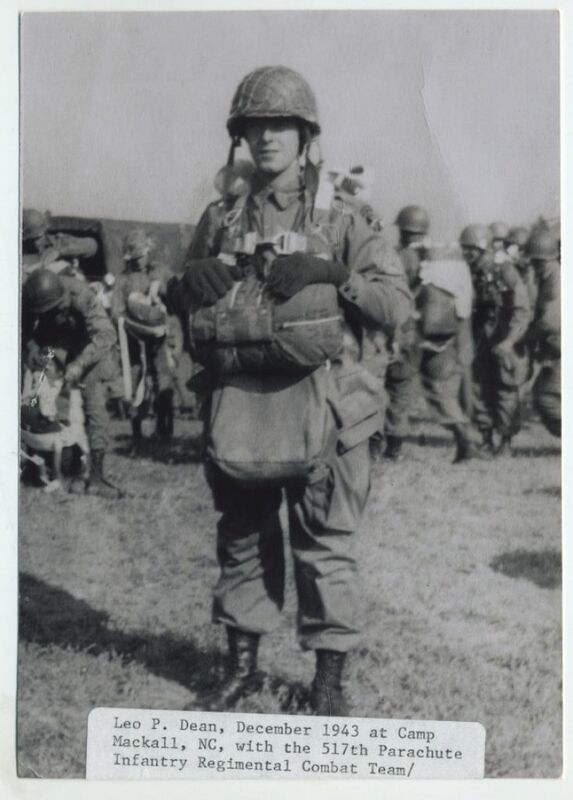 Working in concert with the 3rd, 36th and 45th Infantry Divisions, Dean’s airborne group began liberating one small French town after another, at great cost in American lives. He’s already purchased airline tickets to return back there this Aug. 15 for solemn memorial services at a U.S. military cemetery. He’s been there each of the past 10 years. Dean said each town that was liberated still holds parades, in which he’s participated, and ceremonies to mark the date of their freedom from Nazi control. “Those French people on the Riviera are really very good,” he said. The combat lasted 90 days until November as Dean’s outfit pushed German forces into northern Italy. The Allied thrust also drove northward in France. A month later, he was preparing for a parachute the next spring into Germany, when Hitler counter-attacked with the Battle of the Bulge. Dean was quickly transferred north and spent the winter of 1944-45 in northern France and Belgium. After Germany surrendered in May, fighting still raged in the Pacific against Japan. That summer, Dean was ordered back to the U.S., expecting to be sent to Alaska to prepare for an invasion of northern Japan. 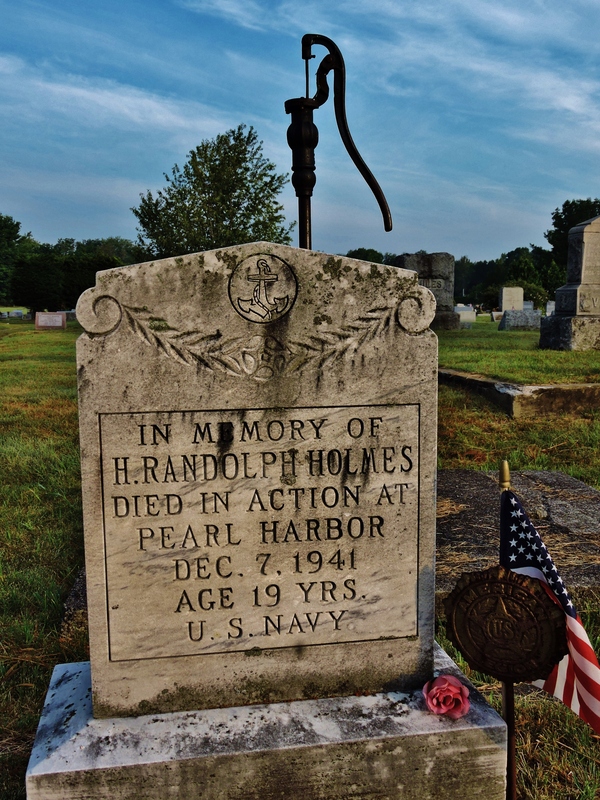 However, two days before his troop ship reached New York, he learned that Japan had surrendered, too, following the atomic bombings of Hiroshima and Nagasaki. “I lucked out on that one,” Dean said. Coming home, he went to Siena College, became a certified public accountant and had a long career in the insurance business. Never one to stay idle, his latest job is with Norvest Financial Services in Latham. Dean understands why most people don’t care to take part in Saturday’s skydiving celebration. However, anyone who shows up can enjoy a champagne toast afterward. Adirondack Skydiving Adventures is located at 10913 Route 149 in Fort Ann, 9.3 miles east of Route 9. Dean’s jump is scheduled for 9:30 a.m. Even those who don’t make it can still help him. “Pray for good weather,” he said, smiling.